Maybe you may want to thank hipsters for this one because of thanks to them, coconut water has become an increasingly popular beverage. But, do not think that you just look cool when you drinking, or carry a bottle of it around, in reality, you are getting so much more than just maintaining your hipster cred. Coconut water is tasty, is refreshing, and, as mentioned before incredibly good for you. It packs a lot of good nutrients and minerals that you don’t get more frequently from other foods. Coconuts come from a palm tree called Cocos Nucifera, and coconut water is the liquid we find within the fruit. It is naturally produced inside the fruit and it is 94% water and little to no fat. It is a great source of fiber, vitamin C, and plenty more vital minerals, we can’t just get enough of. With stress and injuries, our body increases the production of free radicals, and when there are too many of them running wild in our system it is said our bodies enter a state of oxidative stress damaging our cells and increasing the risks of developing a major disease. In order to prevent this, you may want to start drinking coconut water on a regular basis as it comes packed with anti-oxidants which helps to fight off those free radicals and prevent them from damaging our cells. And with the reduced amount of free radicals, there is also a reduction in high blood pressure, triglycerides, and insulin. As indicated before, many studies conducted by renowned organization have proven coconut water to be extremely effective in lowering the levels of sugar in our blood which in turn, makes it an incredible ally in fighting off diabetes and other sugar-related conditions. 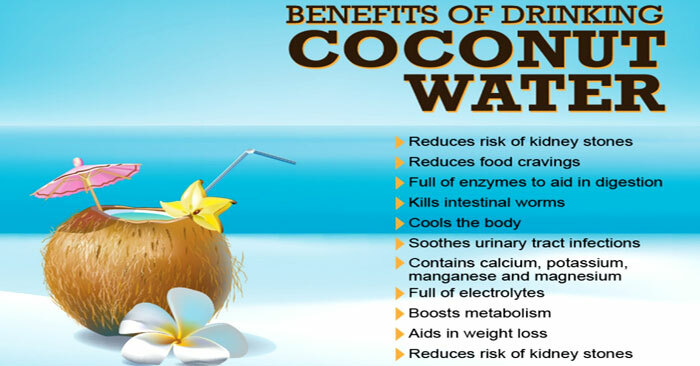 In addition, coconut water is an awesome source of magnesium which is also a strong ally against diabetes, improving our insulin sensitivity and lowering the levels of sugar in the blood. If you want to prevent stones from developing in your kidneys, you will be told to drink a lot of fluids, and guess what? Coconut water is just great at helping you prevent them. Several studies have concluded that coconut water may be better than plain water to accomplish this. Coconut water can also have a positive impact on your heart health, by drinking it on a regular basis you are reducing the risks of ever developing heart conditions.